Balancing meat, dairy, fruits and veggies, grains, beans, olive oil, fish, and other food options packed with omega-3 fatty acids, the Mediterranean diet offers vast physical and mental health benefits. Research funded by the National Cancer Institute and the National Institutes of Health found that women who followed the Mediterranean diet were more likely to increase their lifespan while preventing the onset of chronic illness. According to the American Heart Association, over half of the calories we consume under the Mediterranean diet come from monounsaturated fat, usually found in olive oil. Unlike saturated fat, monounsaturated fat does not increase blood cholesterol levels. Researchers from Harvard School of Public Health and Brigham and Women’s Hospital in Boston issued questionnaires to 10,670 women, asking about their current health status including dietary habits and physical well-being. The women were in their late 50s or early 60s when the study launched between 1984 and 1986. They had no signs of 11 major chronic illnesses. Fifteen years later, the study’s participants were asked to return for a follow-up questionnaire as well as assessments to determine their mental and physical well-being. Results indicated that women who adhere to the Mediterranean diet’s guidelines were 40 percent more likely to live past the age of 70. Women were also less likely to develop chronic illnesses, such as heart disease, diabetes, and Parkinson’s disease. "Women with healthier dietary patterns at midlife were 40 percent more likely to survive to age 70 or over," lead researcher Dr. Cecilia Samieri told HealthDay. "The Mediterranean diet is characterized by greater intake of fruits, vegetables, legumes, whole grains and fish; lower intake of red and processed meats; moderate intake of alcohol; higher amounts of monounsaturated fats, mostly provided by olive oil from Mediterranean countries; and lower amounts of saturated fats." A similar study that tracked the Mediterranean diet’s health benefits, specifically for neurological development, revealed its ability to prevent mental decline associated with Alzheimer’s disease. Out of the 11 observational studies carried out by the research team, nine found a link between the diet and increased brain function as well as decreased risk of developing dementia. 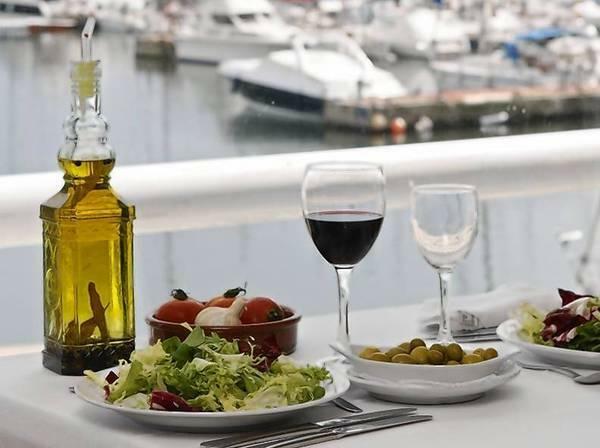 “Mediterranean food is both delicious and nutritious, and our systematic review shows it may help to protect the aging brain by reducing the risk of dementia,” said the study’s lead author Iliana Lourida. “While the link between adherence to a Mediterranean diet and dementia risk is not new, ours is the first study to systematically analyze all existing evidence." Source: Samieri C, Sun Q, Townsend M, et al. The Association Between Dietary Patterns at Midlife and Health in Aging: An Observational Study. Annals of Internal Medicine. 2013.